Children need time each day to exercise and use their large muscles. 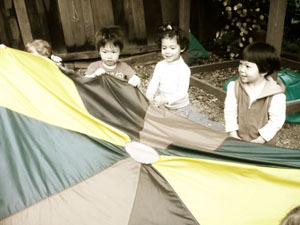 They enhance their large motor and social skills during outside playtime. 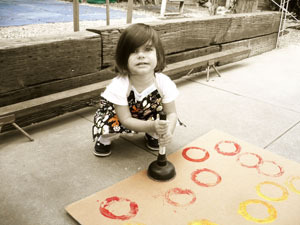 Children engage in throwing, kicking, and rolling balls, imaginative play, climbing, sliding, and swinging. This is an opportunity for children to socially interact and engage in dramatic play with their friends. Exploration of the wide variety of equipment available for the children promotes a healthy, physical body by developing flexibility, endurance, and strength. 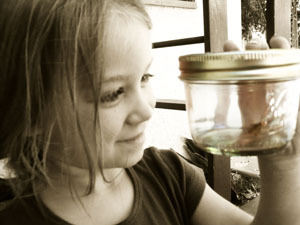 Butterfly Garden Preschool provides children with the space and freedom to be kids. The playground contains swings, a slides, a fort, a sandbox, and climbing structures all of which are surrounded by a garden. The children enjoy the open space to ride tricycles, drive cars, or bounce on bouncy balls. Woodworking and sensory tables are also available for children to explore and create. Children are free to water the garden, pick weeds, rake leaves, and observe bugs. We eat lunch outside on child-size picnic benches surrounded by all the colors and smells that the garden offers. The outdoor curriculum honors the natural environment and the children who play there. We allow blocks of time for uninterrupted, child-directed play. By allowing children ample blocks of time outdoors, children's play and social skills become more sophisticated.